Cats shed a lot of hair during the year. I have used many brushes, but only the brushes of FURminator seems to take the cake in grooming. Check out our FURminator review. We got many short-haired kitties that already loose a lot of hair. Believe it or not, but it is daily cleaning in our house with the amount of hair to be found everywhere. A while back we had two very long-haired cats staying with us (animal protection). They really needed regular brushing, or our house turned into hair heaven in a matter of hours. It is not just the hairs that are on the ground that you need to get rid of, but the hairs are also ending up on your sofa. When you sit on your sofa watching your favourite movie, you then have just taken a bunch of this hair onto your clothing. You then enter areas of your house or beyond that your cat doesn’t have access to. Think about places like your bedroom, your car and your job. Now you got hairs everywhere!! Once on your clothing it is very difficult to get it off again. Luckily we got our tricks, such as using the tumble dryer, a velvet hair removal brush or the cheaper sticky rolls. So, whether you have long-haired or short-haired cats, cats that stay inside all day or those that are allowed to go outside; your cats will shed their hair EVERYWHERE. Removing cat hair from your house is a really big and tedious job, so you better minimize the shedding. The shedding problem isn’t only a hazard to you, but also a threat to the health of your cat. Cats groom or wash themselves often. They like to stay clean and keep their coat lubricated with the protective grease that spreads while stimulating the hair roots. While they groom with a rough tongue and using their teeth to bite away dirt and knots in their fur,they ingest a lot of hair. This hair clump forms a ball, called a hairball. This hair is not digested in their stomach, but stays there until it either goes out via feces or they have to try to puke it out. When they don’t manage to puke it out, it can form a blockage in the stomach or it can cause them troubles puking it out. So preventing too much hair entering the stomach of cats or your sofa is definitely a better option. 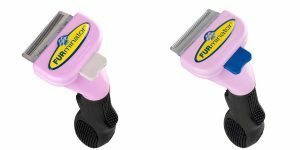 FURminator is both the brand and the name of a line of products in the grooming Industry. There are many different brushes for different pets and purposes. There are brushes for cats and for dogs. We have experience with both. We got the FURminator brushes for our cats and we have also experience using the FURminator brush for dogs (our families’ dog Miss). The design of all the Furminator brushes seems to be simple and small, but is build to last. The brushes of Furminator are patented and are therefore the only one around. Some manufacturers surely have tried copying the shapes of the FURminator, but are not allowed to copy the brush design itself. Although it looks like a small brush, it has a decent weight to it. While having the brush in your hand it feels like you got an easy to use yet powerful tool to work your ways over the fur of your entire cat. The brush is designed in such a way that brushing is an easy job of lightly laying the brush on your cat and pulling it gently towards you from head to tail. The teeth of the brush are made of stainless steel, which is perfect for the harder job of actually removing the lose hairs from your cat. To remove the hair from the brush’s teeth, you press a button that brushes through the brush teeth to remove all hairs. This is a patented design, named the FURejector. It works very elegant and easy. Furminator comes with a range of different brushes, such as for both dogs and cats. They also come for the different types of fur, such as long-haired cats and short-haired cats. The design of these brushes seem to look similar to each other, but the size of teeth and handle might differ greatly. The more standard brushes for most cats. The long-haired cats brush is for cats fur being longer than two inches, while the short-haired cats brush is for cats fur that is less than two inches in length. These two brushes are essentially the same as the previous two, but they have a larger handle, steel and brush bar to it, so that brushing will go quicker on a larger cat. With this special designed tool, you will be able to remove those mats from your cats fur before you start brushing with the regular brush. Apart from the fact that brushing mats will bring great discomfort to your cat, it can also break the brush’s teeth. It is important to remove any tangles. You could use another type of brush for this, such as the FURminator Dual Brush. Do not bathe your cat before De-Matting as this will tighten the mats and make it extra hurtful for your cat. Bathing should be done after de-matting and de-tangling but before FURminator fur brushing. Prepare both yourself, your cat and the environment where you want to start brushing your cat. The cat better be a bit relaxed and not distracted by outside noise. For yourself it can be best to not have your best clothing on you, because you are going to get a lot of loose hairs on your clothing. Also, if your cat might get uncomfortable, an occasional claw might show up, so perhaps long-sleeved clothing might also do wonders. Check your cats fur for any mats or tangles. These need to be removed from the coat before starting with the FURminator brushing. The FURminator brush teeth can break on mats or tangles. 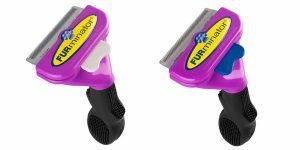 FURminator has a special brush for de-tangling and de-matting your cats fur. In some cases it can be a good idea to give your cat a bath with shampoo before brushing them. The cats fur needs to be dry entirely, before you may start brushing. FURminator has a range of bathing products available for your pets, both those that need the use of water and those without. Long-haired cats have a thicker fur to get through to the undercoat and need therefore a different brush with longer teeth. Short-haired cats need a brush that has shorter teeth. Be sure you choose the right brush for the job. Don’t use a brush that is meant for dogs on cats either. If you are alone, have your cat on your lap or sit on your knees on the floor hand have your cat between your legs with the tail towards you / head away from you. This way it is easier to brush with the direction of the hair. Put the brush lightly behind the head in the neck and pull it lightly towards you. By not putting too much pressure on your cat, it will feel more comfortable for your cat and it will also reduce straining yourself too much on the already heavy job. Be careful around the stomach and genital area. Also be sure to not regularly go over the same area in short strokes, but rather to use long and easy strokes over the entire cats body. Should I use the brush on a cat with sensitive skin? The FURminator brushes should be used on pets it is designed for. Do not use it on pets that are not short- or long-haired shedding breeds or on pets that have an overly sensitive skin. If your pet is somewhat sensitive or dry in the skin, do not brush them too often. How often can I use the FURminator Brush? For regular brushing it is advised to brush 1 to 2 times a week. Of course it could be required to brush more often in heavy shedding seasons. Also sessions should not last more than 10-20 minutes each time. Cats are very good in telling you when they have had enough, but if your cat loves the brushing, it is best to keep to the 10-20 minute rule to prevent red or irritated skin. Does this cut the coat, or just brush the undercoat? The brush removes loose hair from the undercoat and fur and brushes the undercoat. It doesn’t cut anything. But you should remove mats and tangles from your cats fur first, because they get stuck in the brush and will pull heavily on your cats skin. It can cause hairs to be pulled out by the brute force of stuck mats in the brush. The brush can break or bend from the mats. It is best to remove the tangles first by using a FURminator Dual Brush and then removing the mats with the FURminator Adjustable De-Matting Tool. What brush to use on a large cat (>15 lbs)? The size of the cat does not have much to do with the job of brushing, but the large version of the long- or short-haired brushes has a larger area to brush at a time with a wider brush and longer handle it will be an easier job. Just make sure you got the right tool for the job (long-haired vs short-haired) and remove the mats and tangles before starting with this tool. It is every time again and again surprising to me just how much loose hair is removed from our cats when brushing them with only a very light touch of the FURminator brush. Even when you think they have a fairly nice fur, you remove a whole handful of loose hairs. We got the short version of the brush, because our cats are normal / small sized. It is really easy in use and our cats seem to like it very much. With less itchy loose hairs in their fur, there is less of a job to groom themselves, fewer hairs on our sofa or floating in our house and less hairballs in their tummies. A good brushing session helps your cat staying healthy and happy with the FURminator De-Shedding Tool. I think a lot of cat owners don’t make the connection between grooming your cat and their vomiting. I noticed that when I de-shed my cat often, there is much less vomiting (and this makes us all happier). We tried a velvet hair removal brush, but I’ve been looking for something more effective. I’ve heard good things about the FURminator, and I appreciated your tips for using it properly. Hi Laurie! Thanks for your comments. Did you buy the velvet hair brush to remove hairs from clothing or to de-shed your cat? The FURminator is an excellent brush and they got a whole series of brushes meant for both cats and dogs that can help you in better manage the hairballs. WHAT!? This is awesome. I have never owned a cat because I get a little allergy when I am around them too much. However, I have been cat sitting a cat for 3 months while its owners moved across the country and I haven’t even thought about using a brush to help get rid of some of the irritants. It would probably save me from having to wash all the bedding several times a week just to keep up with the fur discharge. The brushes are definitely a big help here in our seven cats house hold and it will probably also help your cat sitting. Although the allergy you are experiencing might be have to do with the saliva or the fatty substance on the fur instead of the hairs themselves. But brushing will definitely reduce the amount of cat hairs on your clothing and bedding and anywhere else in the house. Hi! This is a great post. I do not have cats so I was reading it for the purpose of determining whether it was good for dog hair. (I have two large dogs that, though having short hair, shed a lot!) I was delighted to find that there are brushes available for all kinds of animals. Regular brushing seems to really cut down on the spread of hair through the house. Many thanks for your recommendation!! FURminator has a whole range of brushes and other products meant for all sorts of furry pets. Some of the brushes are smaller and meant for smaller animals, such as rabbits and gerbils and the like. FURminator has also a set of brushing tools for dogs, such as the Large Long-Haired FURminator Deshedding Tool for Dogs (following this link to Amazon, you can also choose different hair types and brush sizes).